Three months after she sensationally quit her Studio 10 hosting role at Network Ten, the legendary Ita Buttrose has agreed to take up a new on-air role at rival Nine. The 76-year-old Buttrose will reportedly fill-in on Nine’s Today Extra while regular host, Sonia Kruger, is on assignment. Buttrose recently revealed to B&T she’d quit her TV hosting duties to concentrate on her marketing agency, her public speaking duties and to write a novel. 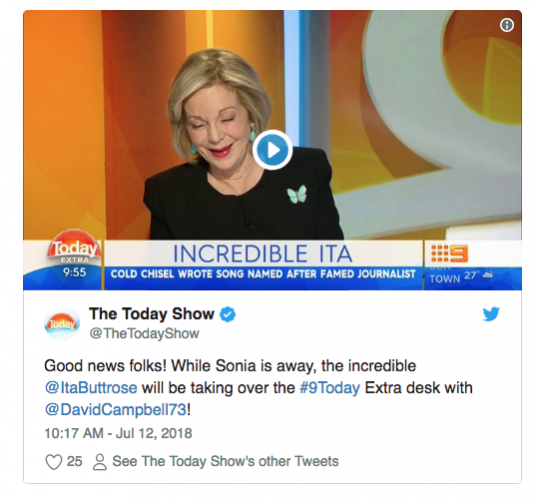 However, Buttrose used an appearance on Nine’s Today show yesterday to reveal she would, albeit temporarily, return to TV in the co-hosting role alongside David Campbell. It’s not the first time the former Australian of the Year has network hopped. In May she appeared on Seven’s The Morning Show to discuss Prince Harry and Meghan Markle’s wedding.